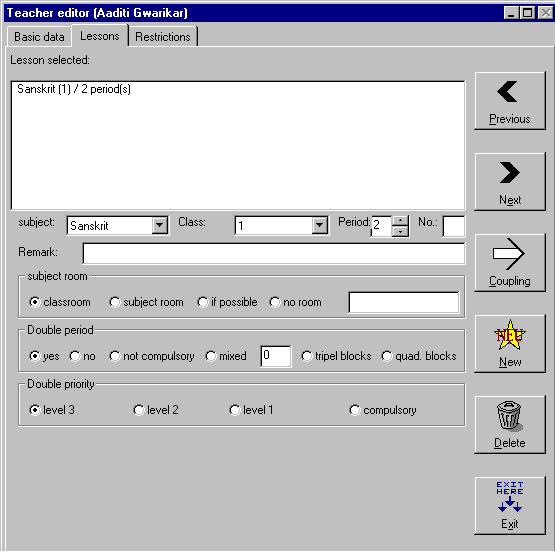 Window of lessons in teacher editor. Here you can enter new teachers & the lessons to be taught by teacher. Here you enter the number of lessons taught by the teacher in each class. This button will allow you to move to lessons of previous teacher. This button will allow you to move to lessons of next teacher. This button will allow you to create a new coupling. This button will allow you to add the lessons & their respective class taught by the teacher. This button will allow you to delete the selected lessons for the specified class. This button will exit from teacher editor & return to main screen of TURBO-Planner.